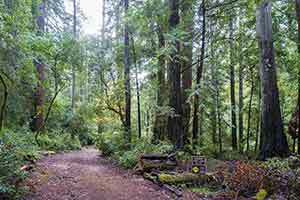 This scenic loop through Sam McDonald County Park starts in Heritage Grove, climbs to a ridgetop meadow with views over the green hills of the Pescadero Creek watershed, then descends through lush redwood forest. 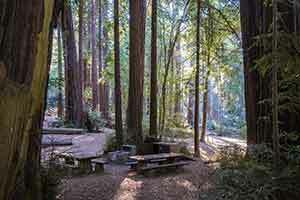 The constantly changing scenery and a few patches of old-growth redwoods makes this an interesting and enjoyable hike. 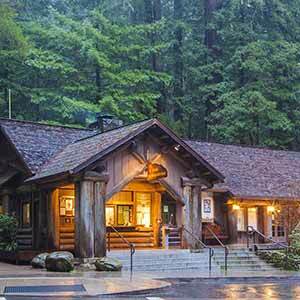 Overnight stays are possible at the Hikers’ Hut. 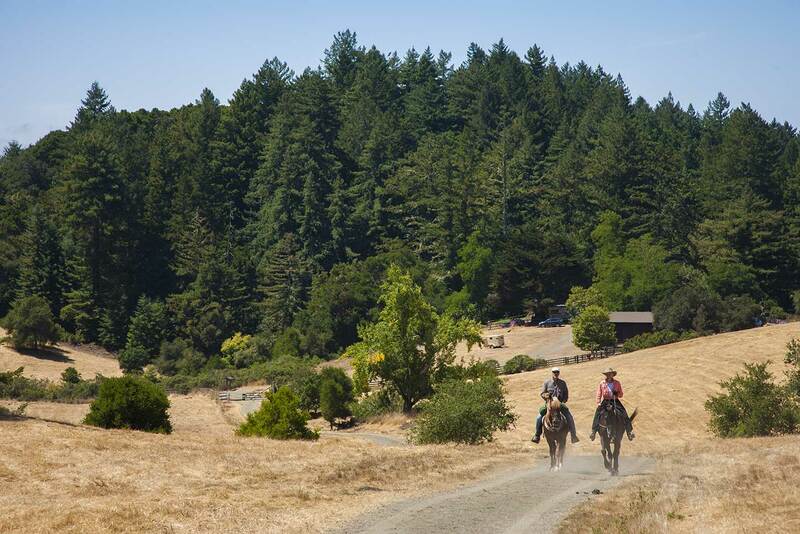 The also loop passes by a horse camp, and in summer horses (and horse manure) are common on many of the trails in the park. Park at Heritage Grove. Enter the grove on the footbridge and almost immediately turn left onto the trail to the Upper Grove. Just after the Upper Grove, follow the sign pointing the way to the Hikers Hut. 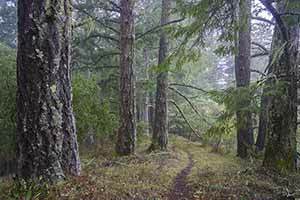 There’s a long climb up a wooded hillside, and finally the trail comes to a gate and emerges onto the grassy ridge, where the trail crosses a fire road. To the left, a faint trail winds uphill a short distance to the Hikers’ Hut, a surprisingly nice cabin which anyone can reserve for $25–30 per person. 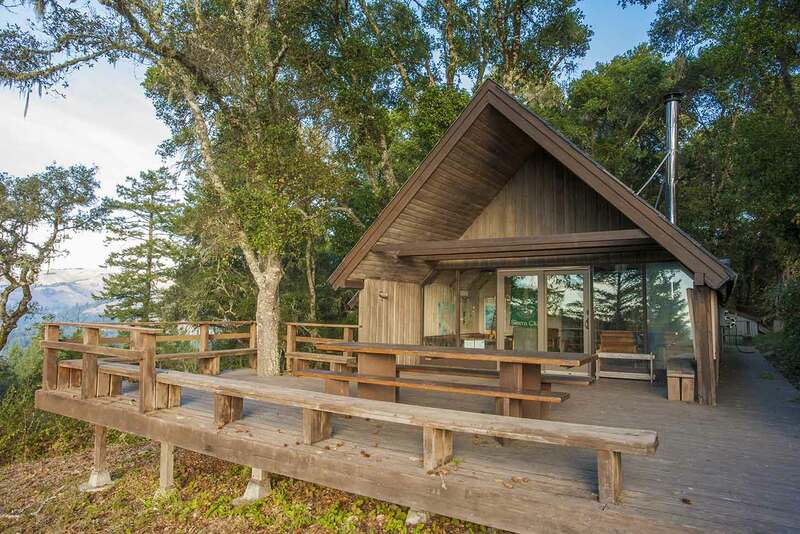 The cabin is in a wonderfully scenic location, on a peaceful ridge with lots of great trails nearby. The hut is supposed to accommodate 14 people, but 4 seems more realistic. There’s a kitchenette and running water but no showers. 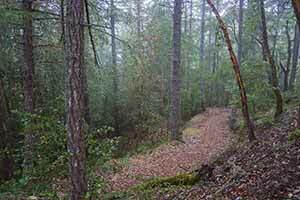 To make the shortest possible loop, you can turn right on the fire road and walk toward the horse camp. However, you’ll miss some pretty good scenery. 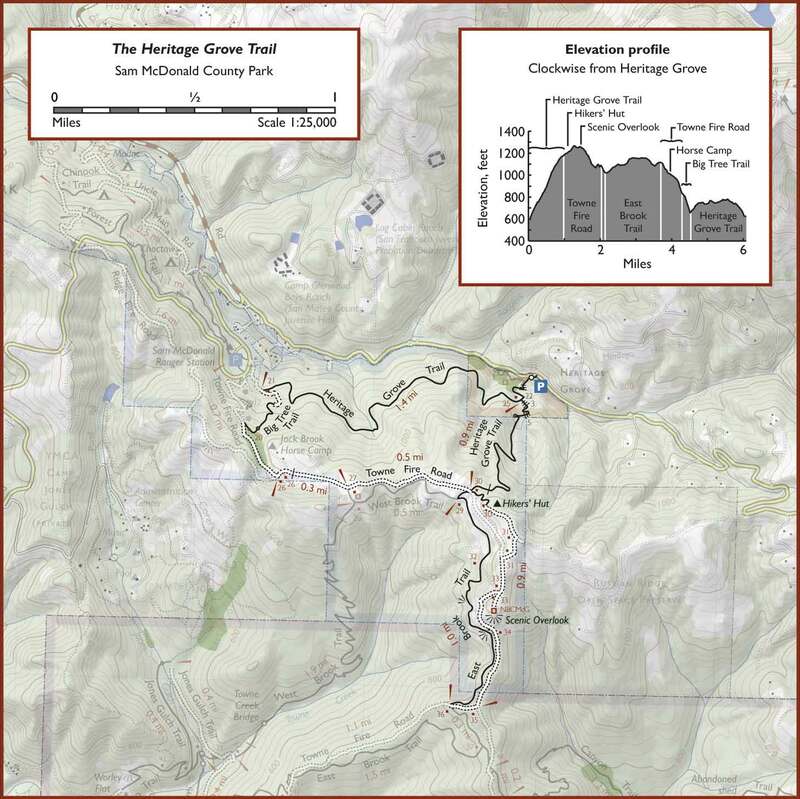 If you have time, turn left on the fire road and walk a half-mile to the scenic overlook, which is on a short spur road (the second dirt road to your left). 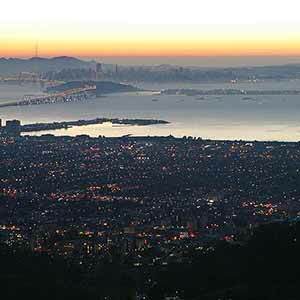 This is actually the most enjoyable part of the loop, since there are some nice views from the fire road. 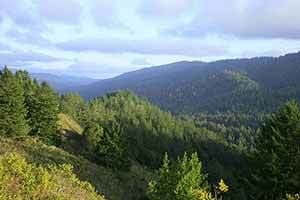 The impressive thing about the overlook is that almost all of the redwood-carpeted hills that are visible are part of Pescadero Creek County Park. After the scenic overlook, continue downhill on the fire road. 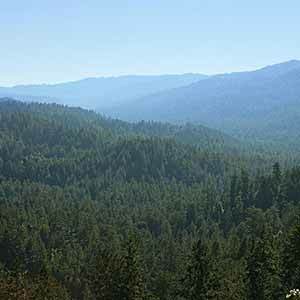 There are a few more scenic views, then the road enters a very nice second-growth redwood forest and undulates up and down over two small rises. 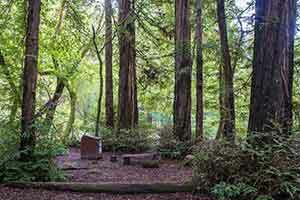 The forest has an attractive lush-but-clean look that’s unique to the Pescadero Creek area. It’s surprisingly peaceful here; there are no roads or houses around, and few hikers visit this part of the park. Only an occasional small plane overhead breaks the silence. At the next intersection of Towne Fire Road and Fire Road Bravo, turn right and continue downhill. After only 100 yards or so, turn right onto the Brook Trail Loop. 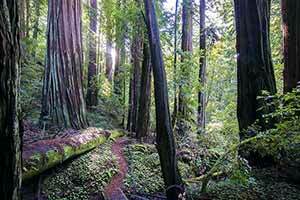 The trail passes through a very attractive redwood forest that includes a patch of old growth. After passing by a picnic bench, the scenery becomes less interesting. 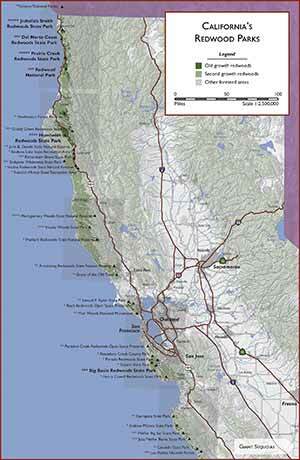 There’s also some poison oak in this area. The trail climbs gently back to Towne Fire Road. 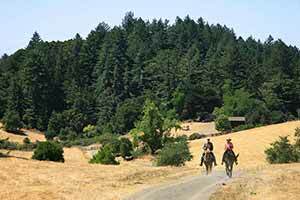 Cut over to the fire road, which runs through a very attractive hilltop meadow to the horse camp. 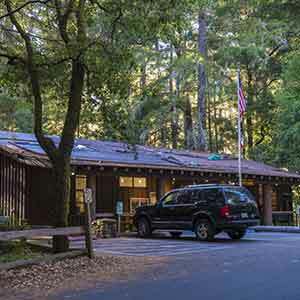 At the intersection just after the horse camp, stay to the right; the road dives into a redwood-filled ravine. 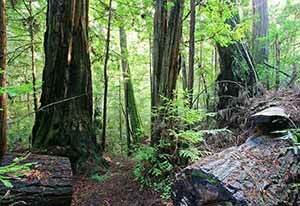 The top of the ravine seems to be old growth, but stumps begin to appear as the trail approaches a large water tank. 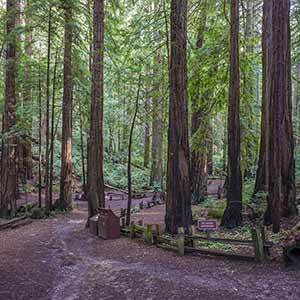 Turn right onto the Big Tree Loop and descend through a partially-logged redwood grove. There are some pretty good-sized trees here, but the Big Tree is actually on a different part of the loop (the short segment of trail with 12 steps off Towne Fire Road). This area is especially scenic after it rains. Turn right onto the Heritage Grove Trail. 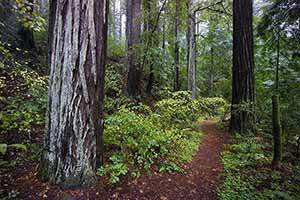 The trail winds through redwood forest that’s quite scenic at first but then gets less interesting as redwoods give way to ordinary tanoak woods. 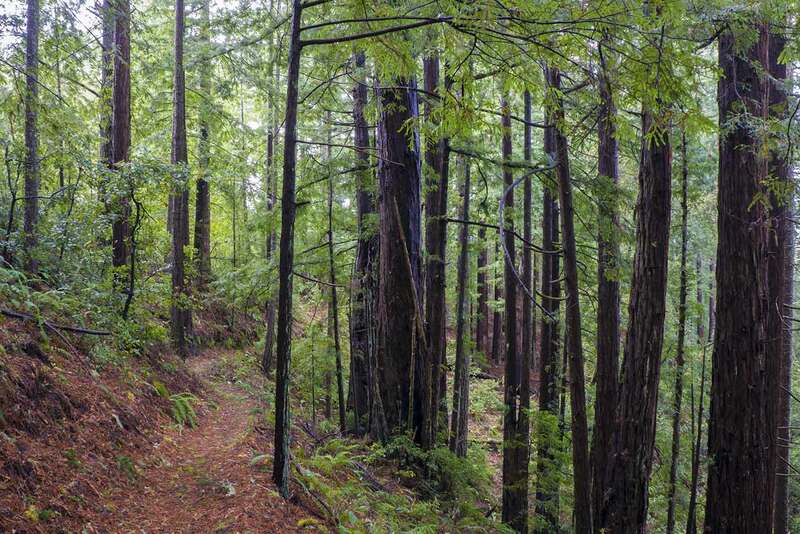 However, as the trail approaches Heritage Grove there’s an improvement in the woodland scenery, as tall, straight redwoods become visible in the distance. 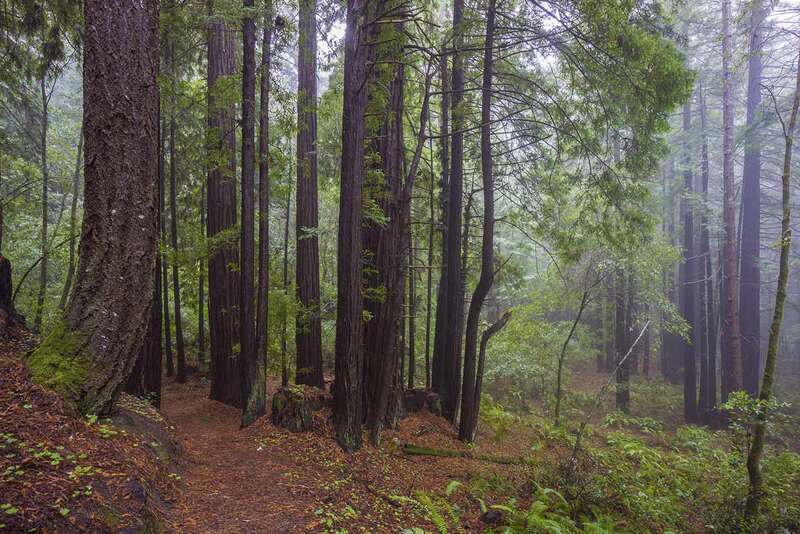 Finally, descend into the scenic redwoods of Heritage Grove.